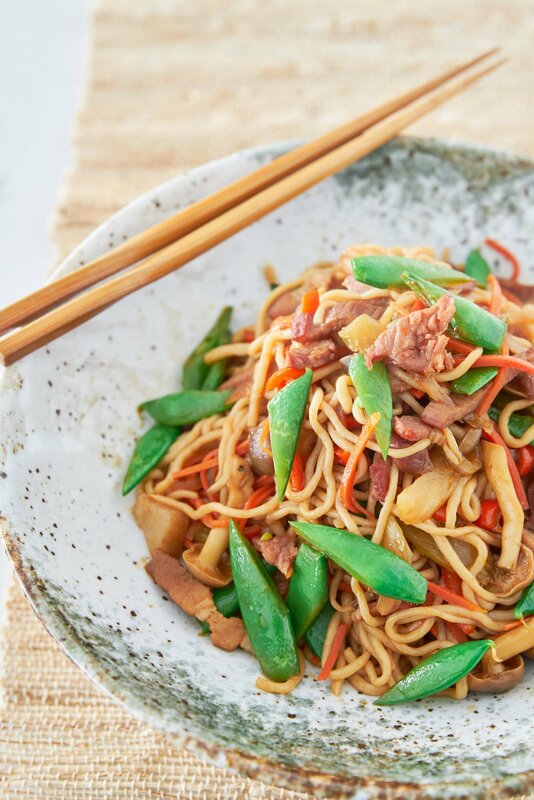 This healthy take on traditional Japanese yakisoba is easy to make and tastes even better than the original, thanks to the addition of a generous helping of mushrooms and vegetables. We had the first snow of the season today. It’s cold and dreary, but having this colorful tangle of savory-sweet yakisoba reminds me of a summertime festival in Japan; complete with fireworks, food stalls and people dressed in colorful yukatas. But after gorging myself over the holidays, it’s time to cut back the calories and I’ve come up with a delicious, satisfying version of the Japanese classic that has only 173 calories per serving, and almost no carbs. The trick is to substitute the ramen noodles that are usually used to make yakisoba for another Japanese noodle called shirataki. Shirataki noodles are made from the corm of the konjac plant, which contains almost no nutrients, beyond some fiber. So why would you want to eat something without much nutritional value? Because the noodles are a reasonable facsimile of wheat-based noodles, and they’re very filling despite containing almost no calories. Each serving of noodles only has 10 calories (yep, you read that right)! There are a few brands out these days, but I used these noodles, which includes a bit of soy milk to give them the right color. Adding a ton of vegetables not only makes this colorful and nutritious, but it also adds some marvelous textures and tastes to the dish, making each bite a little different from the one before it. 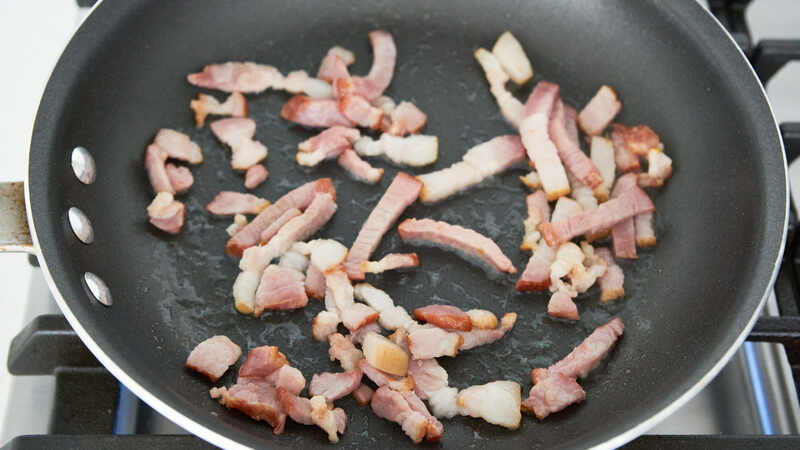 Because the noodles are so low in calories, I splurged a bit and threw in some bacon. This gives the yakisoba an excellent smoky flavor and heaps of umami. For the sauce, I skipped the usual chunou sauce in favor of a semi-homemade version using Worcestershire sauce, ketchup and soy sauce with a bit of honey for sweetness. While my goal was to reduce the number of empty calories in this dish, using shirataki noodles also makes this low-carb, and gluten-free (be sure to substitute tamari for the soy sauce). As a bonus, these noodles won’t go soggy or clump together after sitting, and they won’t get hard when refrigerated, which makes this the perfect addition to a bento box lunch. 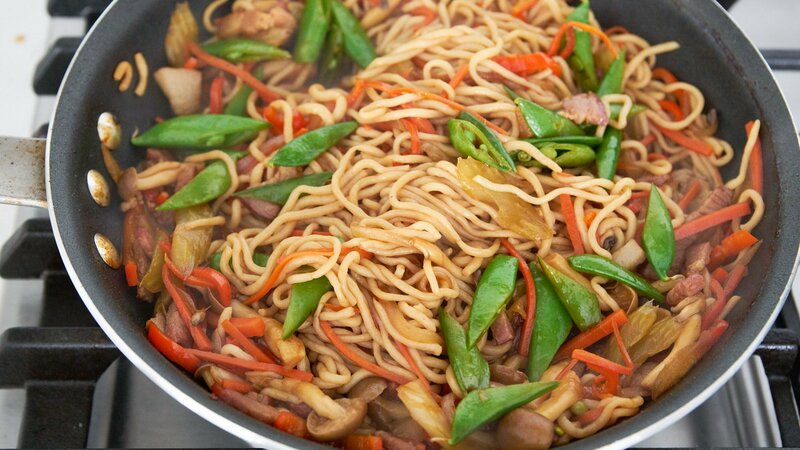 Make the yakisoba sauce by whisking together the Worcestershire sauce, ketchup, soy sauce and honey in a small bowl. 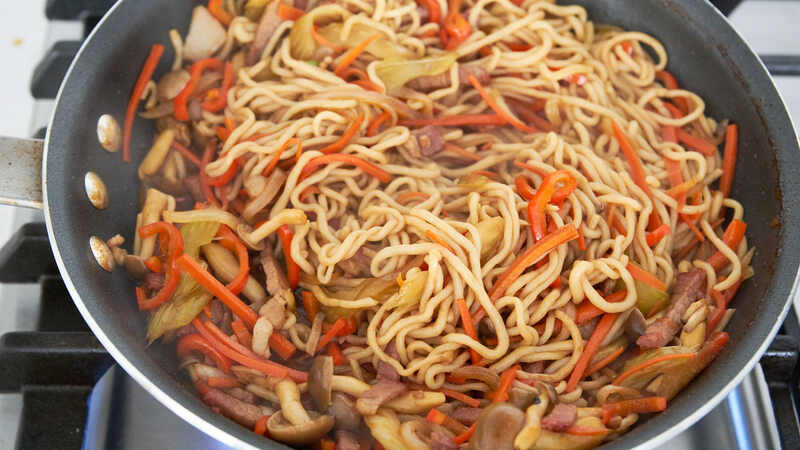 To make the yakisoba, add the bacon to a frying pan over medium-high heat and fry until some fat starts to render out. 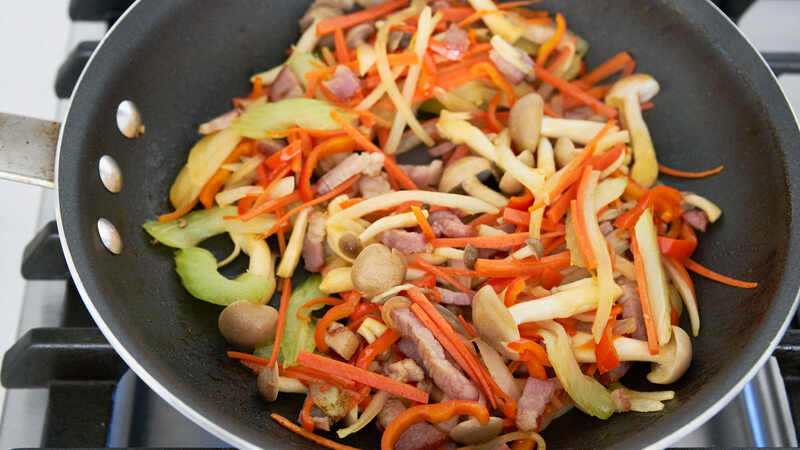 Add the onions, carrots, bell peppers, shimeji, and celery and stir-fry until the veggies are partially cooked. Turn up the heat and add the shirataki noodles and yakisoba sauce. Stir-fry until there is no liquid left. Add the snap peas and stir-fry briefly until the snap peas are bright green.